Got to finally get out of holiday mode, because this is the first piece I’ve wrote since coming off holiday, so really need to get back into the swing of things. These guys have been very patient about this review, because it’s took quite a while as I had a very large list of bands, which have slowly gone down. 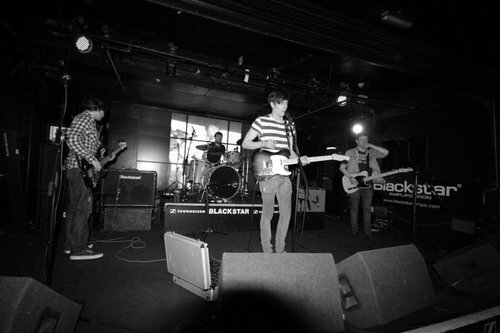 This band are from Manchester, one of the most promising of places when it comes to music, oh and they’re rock/indie. They formed in 2009, so not so long back and have already achieved some credible milestones, those being playing at the Cavern Club and the indig02 arena in London, so not bad really. If you’re wondering who plays what, here you are… James Cotterill – Lead Vocals – Rhythm Guitar.., Joe Dobie – Lead Guitar – Backing Vocals.., Danny Arrowsmith – Bass.., Andy Foreshaw – Drums. They’re working on their new EP Charlie Pop which should be out somewhere around December time, as they told me that they would be getting the rest of the songs in December. This is the first song off their new EP ‘Charlie Pop’, if the rest of the EP sounds as good as this I’m sure that they will be on to a winner because this first song is rather good. Okay lets, break it down. When I first listened to the song, the main thing that stood out to me was the vocals because they were incredibly catchy and quite infectious, and he maintained that level of energy throughout the whole song. Also I think the vocals play an integral part in the song being so catchy, because it really is that catchy. As well as this the lyrics are cool, easy to remember, making it easier to sing, making it easier to sing loud and go mental. The little riff is nice as well, compliments the vocals well, because it’s not a heavy sounding guitar, not much gain on the sound which makes it more clean (thankyou captain obvious), quite a lot of treble on the sound. I think the song is very well put together, sounds quite advanced for a band that have only been together for still quite relatively a short period. In the song it’s got some cool affects, especially to the lead vocals at one point, obviously I liked this part, else I wouldn’t of mentioned it. One thing which I always love in a song is a solo, you can’t beat a good solo, unless it’s a bloke from Westlife singing on his own in a song, you can beat that. Anyway, was starting to worry half way through thinking ‘there’s got to be a solo, where is it, how can they fit this in’, and then it hit and I heard it, and the panic was over and the earth carried on spinning (sarcasm). As solos go, it’s not to bad. No good listening to it quietly while people are asleep, put some ear phones in and turn it up, get the full effect. Unsigned/Independent Musicmanchester bands, manners are wasted on you, new manchester music, New music, transition baby manchester, transition baby manners are wasted on you, transition baby review, transition baby!